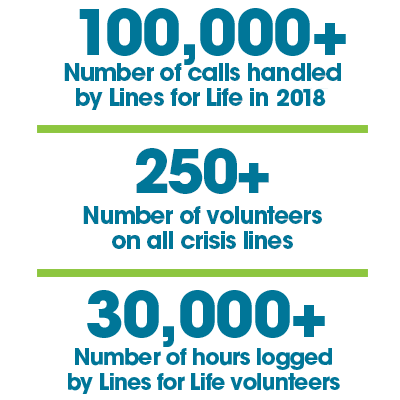 Lines for Life is a regional non-profit dedicated to preventing substance abuse and suicide. We offer help and hope to individuals and communities, and promote mental health for all. Our work addresses a spectrum of needs that include intervention, prevention, and advocacy. We educate, train, and advocate to prevent issues of substance abuse, mental illness, and thoughts of suicide from reaching crisis levels. But when a crisis arises or support is needed, we are available 24/7/365 to intervene with personalized help. Lines for Life would like to acknowledge that the land where our work occurs is the occupied homelands of the Multnomah, Kathlamet, Clackamas, Chinook, Tualitin Kalapuya and Mollala tribes. We acknowledge the painful history of genocide and forced removal from this territory and we honor and respect the many diverse Indigenous peoples still connected to this land on which we gather. Our 24-hour crisis lines offer help and hope to individuals and their loved ones when in crisis or when needing confidential help for drug addiction, alcohol abuse, thoughts of suicide, and other mental health issues. Our staff and volunteer crisis intervention specialists are highly-trained and help thousands of individuals each year. While available to anyone in need, our services include targeted support for those struggling with addiction and recovery, military service members, veterans, older adults, youth, and their families. We are taking the lead on preventing prescription drug abuse by convening the Oregon Coalition for the Responsible Use of Meds. We also offer education and training programs to promote mental health and wellness in communities throughout Oregon. Our hallmark trainings are taught by certified professionals and equip schools and communities to identify and assist people at risk of suicide and to respond to signs of mental illness and substance abuse. We work to destigmatize mental health issues, increase awareness for mental wellness, and encourage reaching out for help. We work locally and nationally to shape the policies that impact our mission. We work with legislators and community partners to create sustainable, positive changes in the way organizations and communities respond to substance abuse, suicide, mental wellness, and crisis. Today, we’re working to reduce prescription drug misuse, abuse, and overdose through expanded pharmacy drug disposal programs. Historically, we’ve worked to limit teen exposure to drugs and alcohol, minimize access to the chemicals used to manufacture illegal drugs, and more.